Part 7 - Off to the Great Outdoors! 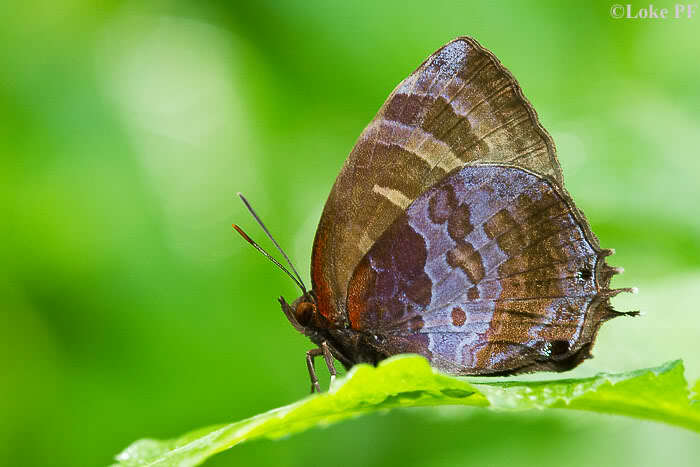 In this seventh and final part of this series, we pack our gears and armed with the theory and tips from the earlier six articles, head off to the great outdoors. 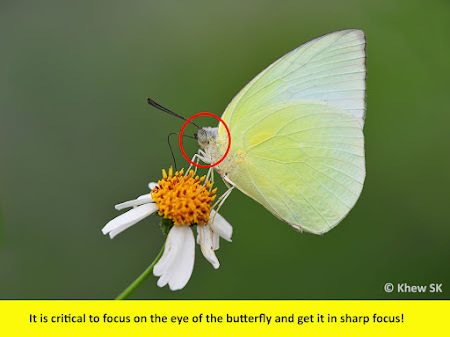 Whilst it is important to know your photographic equipment and learn the technical basics of using your butterfly-shooting arsenal, what remains is to get out into the field and test all the techniques that you have learned. 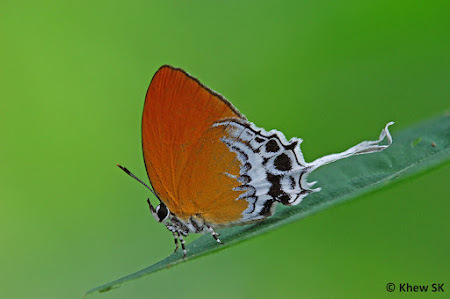 Otherwise, it is all theory and classroom information that you have, and no butterfly photos to show for it! 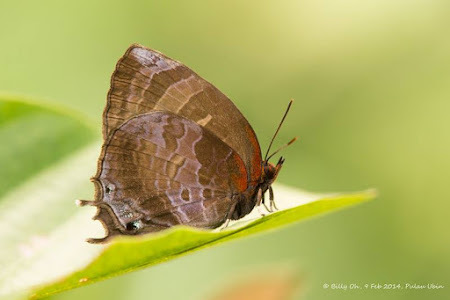 Every veteran butterfly photographer will tell you stories of that "facepalm" moment when they reach their butterfly-shooting destination, only to realise that they have forgotten to charge their batteries, or to slot in their storage card in their camera. Yes, it has happened to the best of us, and there is no embarrassment admitting it. So prepare a mental checklist of your equipment before you head out for a day outing. 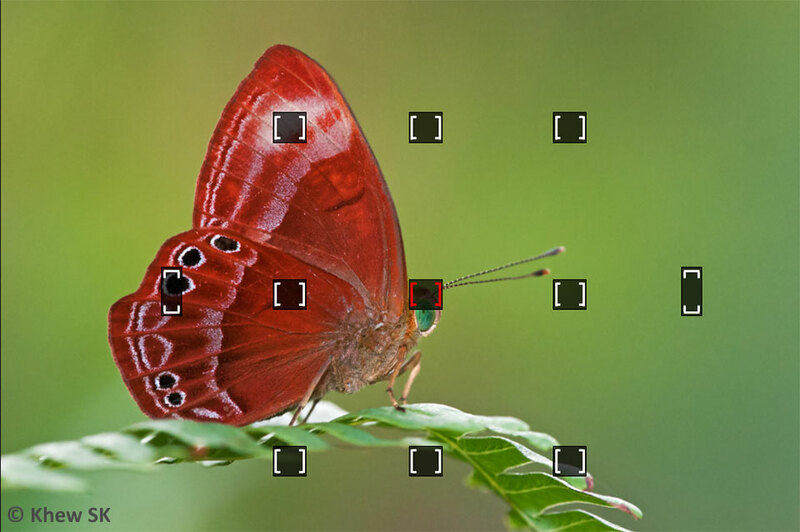 Charge your camera batteries the night before, and make sure you have at least a spare battery in your bag. Make sure you have your CF or SD storage cards in the camera, and your spare(s) in the bag. Charge those AA batteries for your flash and have a spare set on standby if you are going on an extended outing. 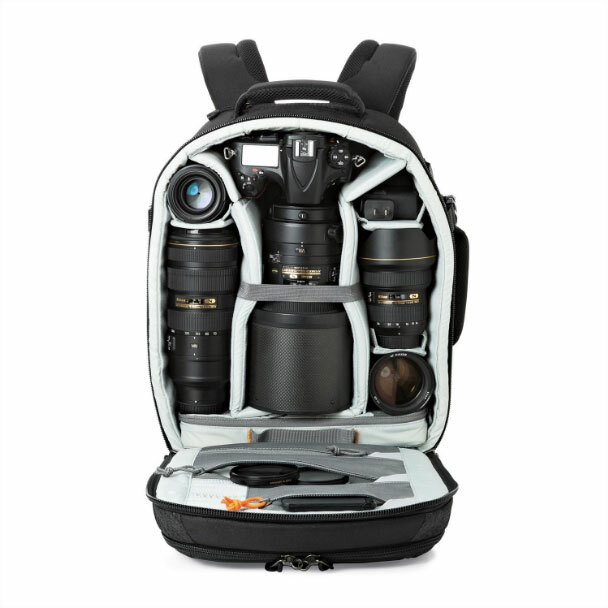 Pack your correct macro lens in the bag! 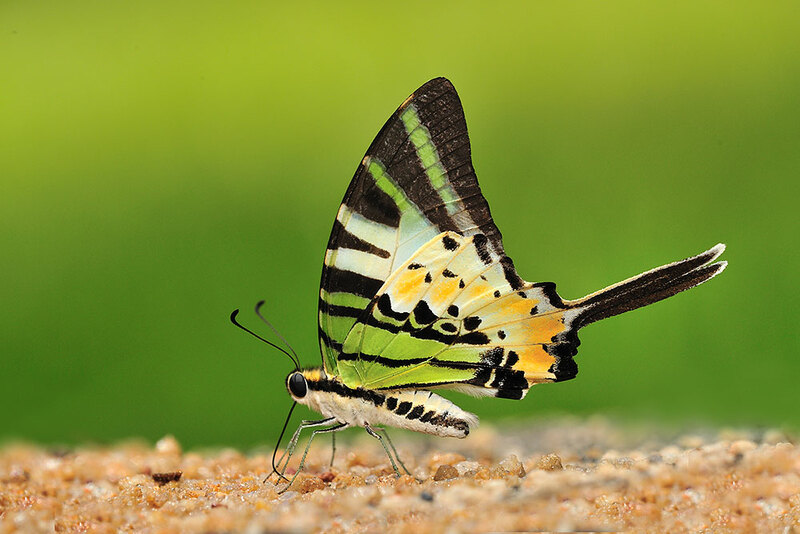 If you are fastidious about the cleanliness of your equipment, carry your cleaning kit and blower brush along. 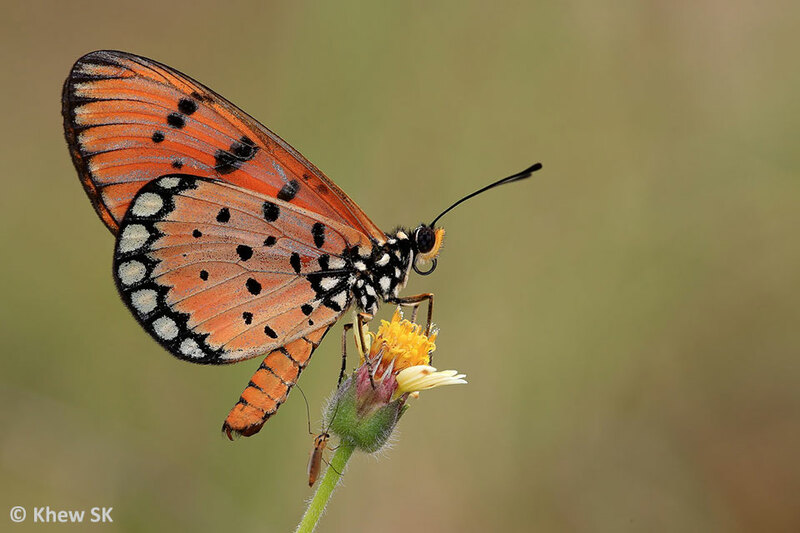 Standardise your other paraphernalia in your bag and ensure that every item has its place in your bag - umbrella/poncho for rainy day surprises, spare towel and T-shirt, mosquito repellent, snacks, a bottle of water (important! 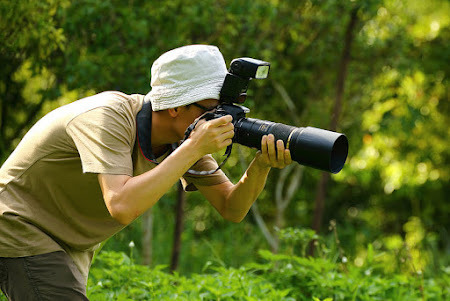 ), hat, camera strap and anything else that suits a day out in the field. 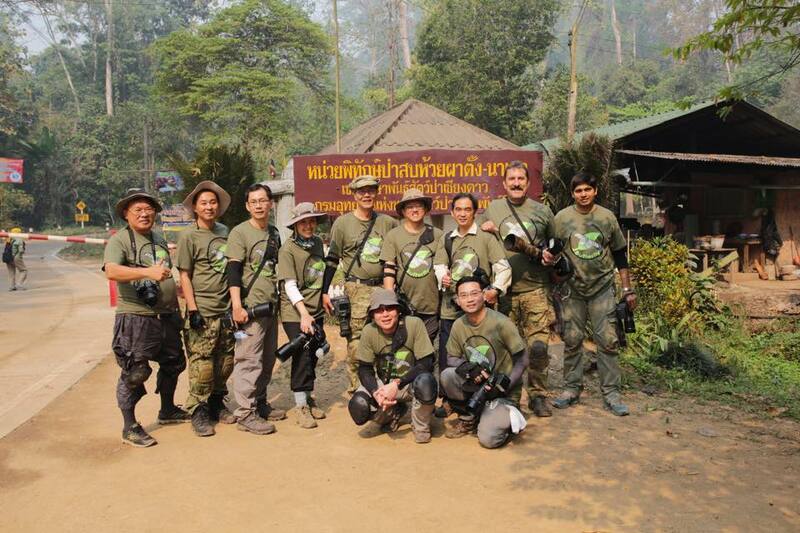 Uniformed, camouflaged and all ready for battle! 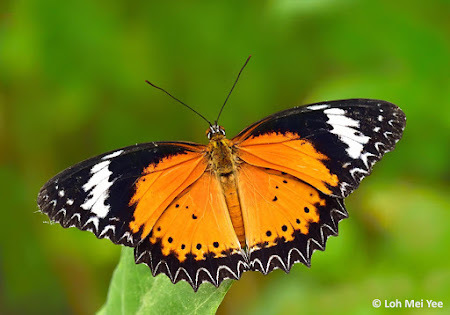 The butterflies will be out-gunned! 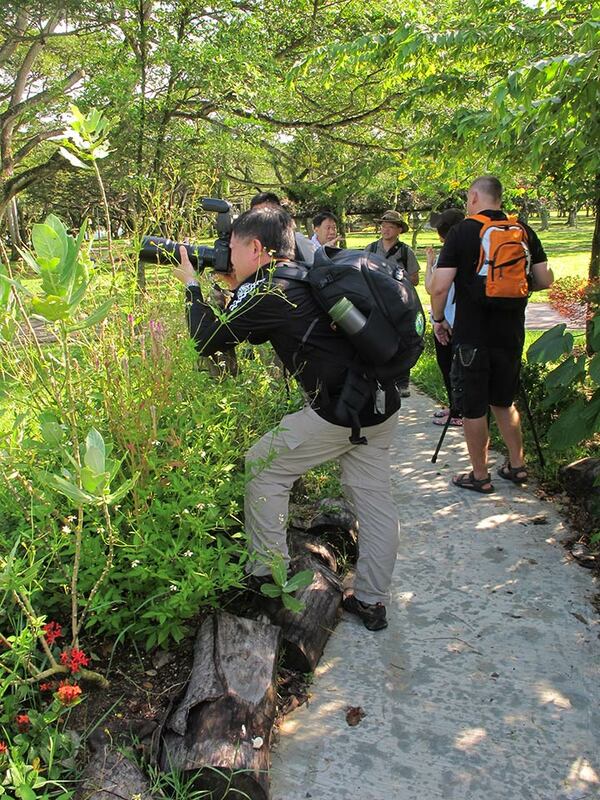 Wear appropriately coloured clothes for your outing. Butterflies (and anything else out there, for that matter) will spot bright coloured objects earlier than drab coloured ones faster, and beat a hasty retreat. 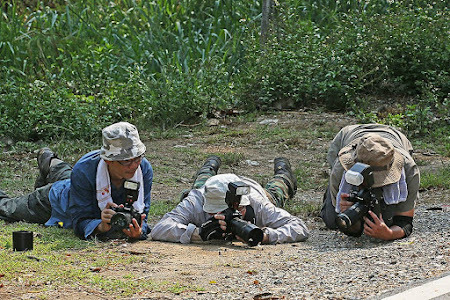 So gear up with dull coloured clothing (browns, greens and beige are best) and try to remain as inconspicuous as possible. After all, would you be wearing a bright red shirt or your psychedelic Hawaiian hat for a safari outing in the Serengeti? 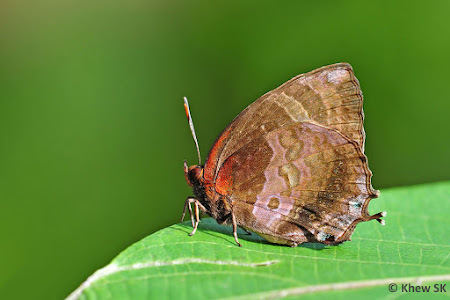 There will be times when you may need to bash through thick bushes and undergrowth to get at a perched butterfly deep in the forests, so try to avoid wearing shorts unless you want to end up with injuries from thorns and sharp twigs. 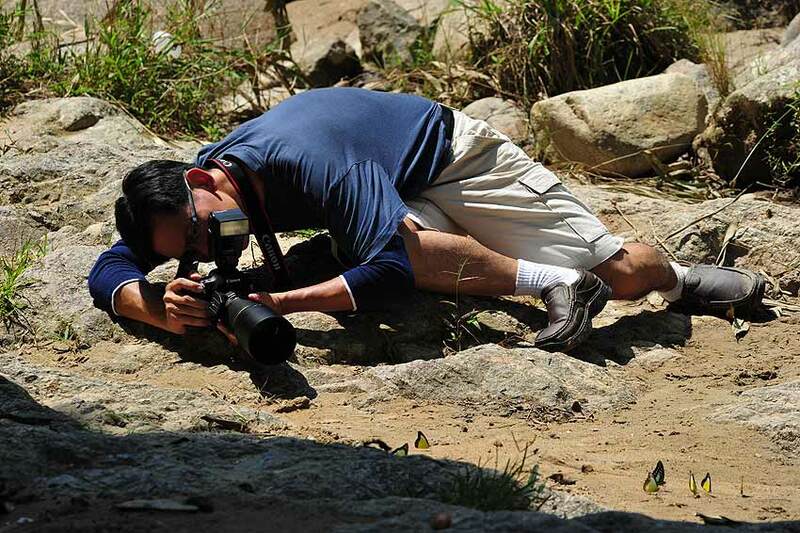 A good pair of trekking/hiking shoes with thick socks would also help avoid any mishaps off the beaten track. 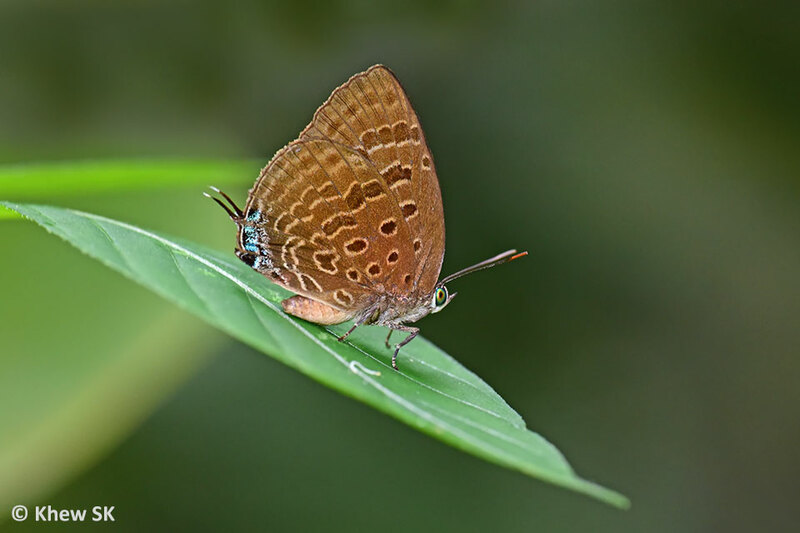 Now you are ready to head out to the great wild yonder to hunt butterflies. But where do you go? 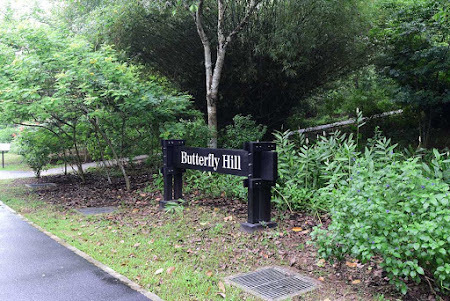 Singapore is blessed with excellent accessibility where you can reach a butterfly-shooting location, usually in no more than half an hour's travel. 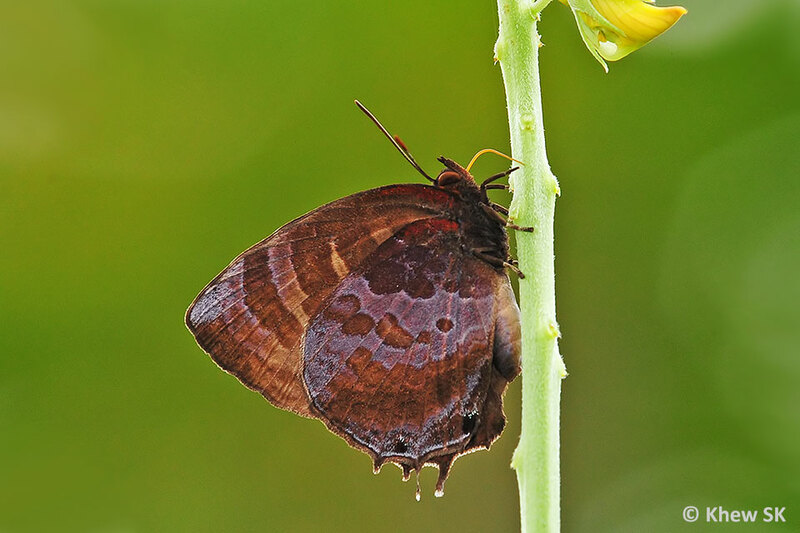 There are many urban parks and gardens where you can find butterflies. 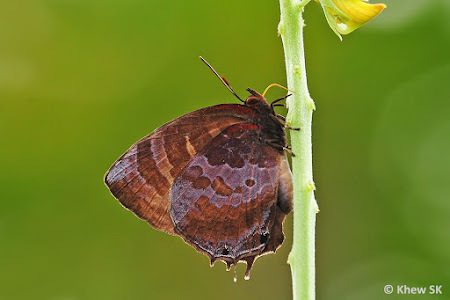 Do check out this blog's section on Butterfly Shooting Locations. 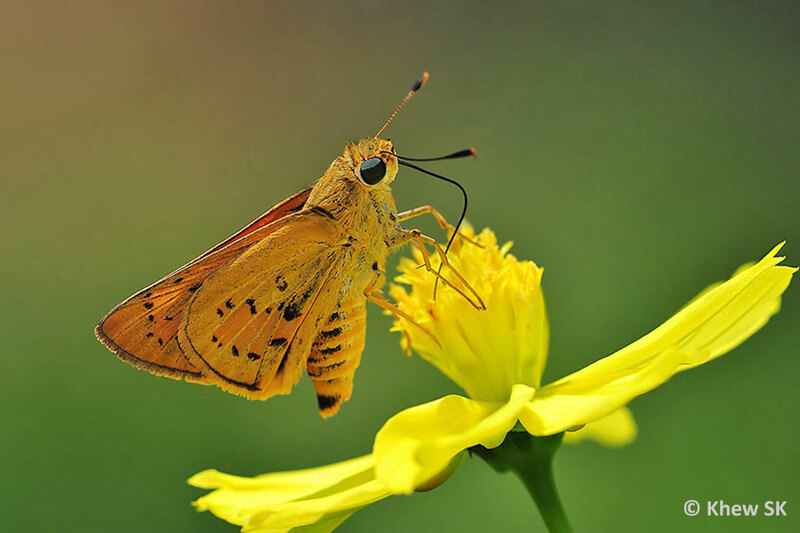 Being active insects, butterflies are best observed when they are distracted with some activity like feeding on flowers, puddling, etc. 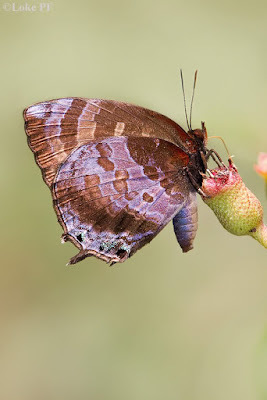 With some experience, the butterfly photographer will quickly learn where to find the "hot-spots" of butterfly activity. On bright sunny days, look for areas with flowering plants where Lantana, Snakeweed, Spanish Needle and other favourite nectaring plants grow. 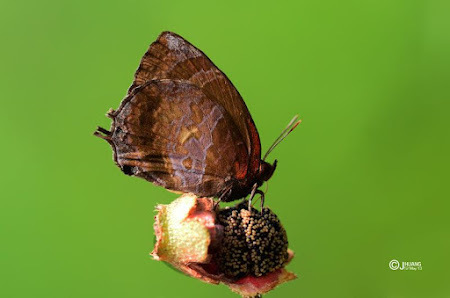 Other species are attracted to rotting fruits on the forest floor, whilst others are attracted to bird droppings, carrion or urine-tainted muddy paths and sandy stream banks. 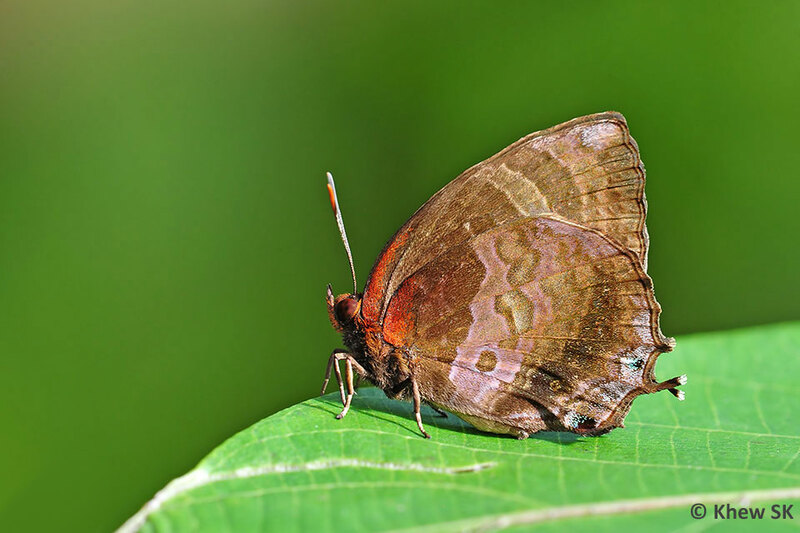 We have often been asked, "what are the best times in the day to go shooting butterflies?" 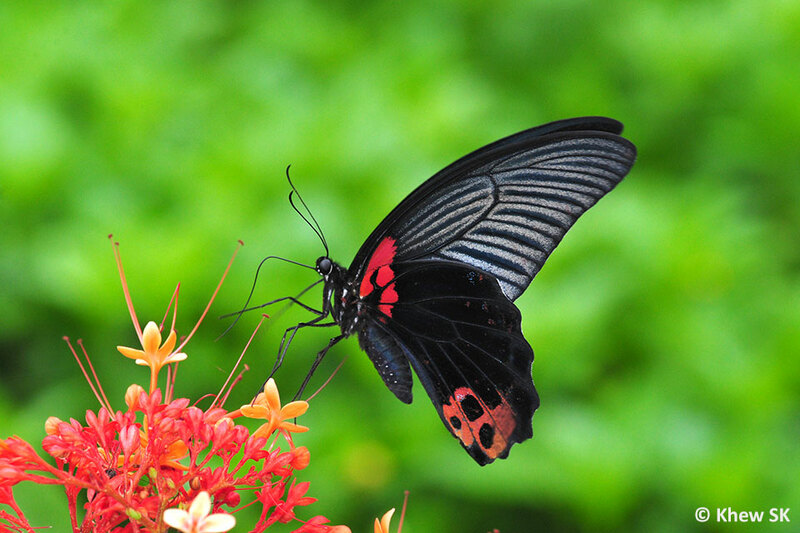 In general, butterflies are up and about and most active between the hours of 9am to about 3pm in the afternoon. However, there are crepuscular species that fly as early as 7am and those that remain active till the dusk hours of the day. 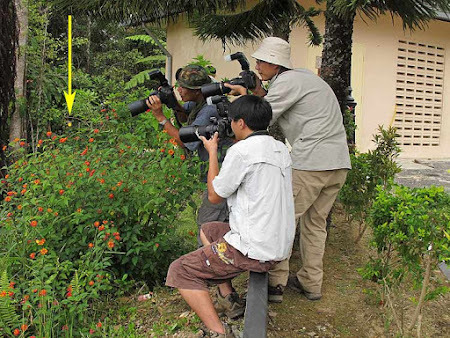 So, if you want to expand your collection of photos to as many species as possible, it would be advisable to vary your butterfly-hunting hours. 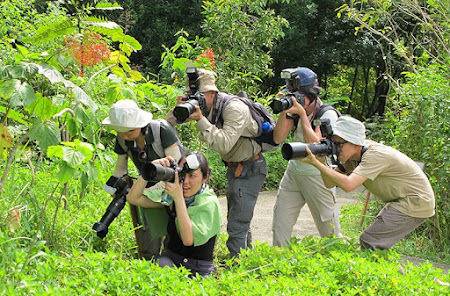 Different handholding techniques for different photographers. Whichever technique suits you best, practise and get it perfect! 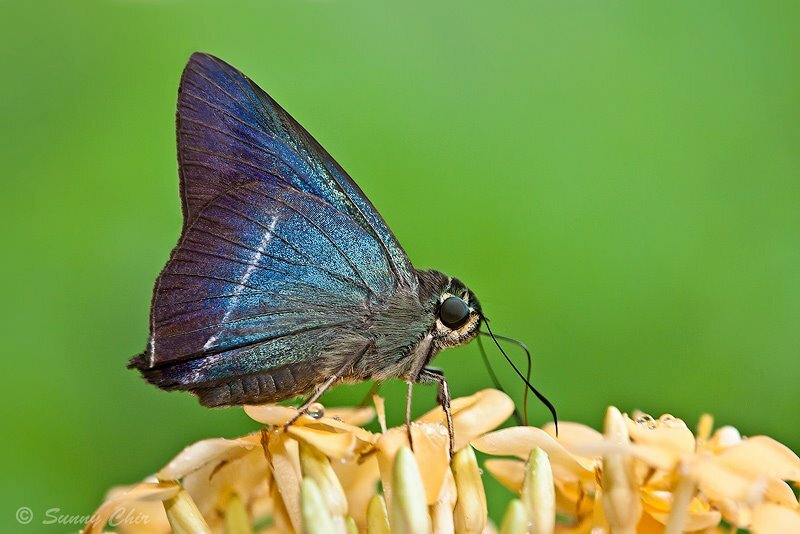 Butterflies are alert to movements, so remember to move slowly and remain still until the butterfly is settled before moving in for a closer look. You should also remember not to cast any shadows over them. 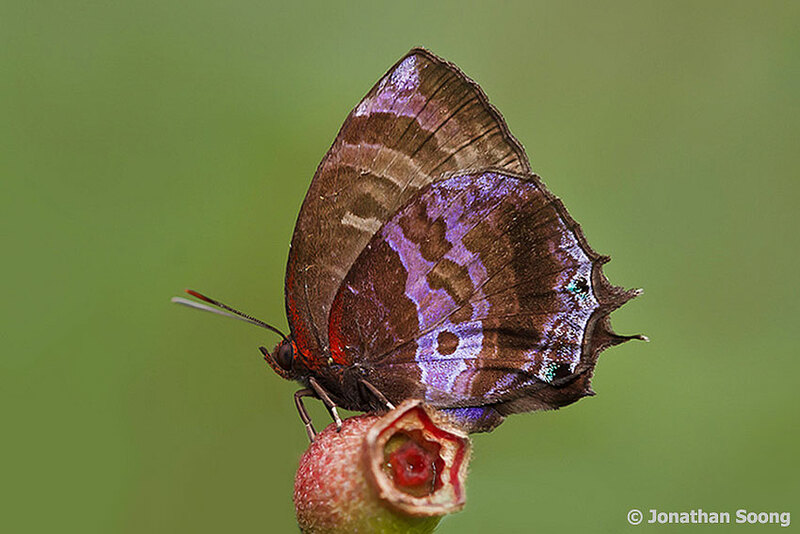 Plan your approach when you spot a butterfly and be patient! 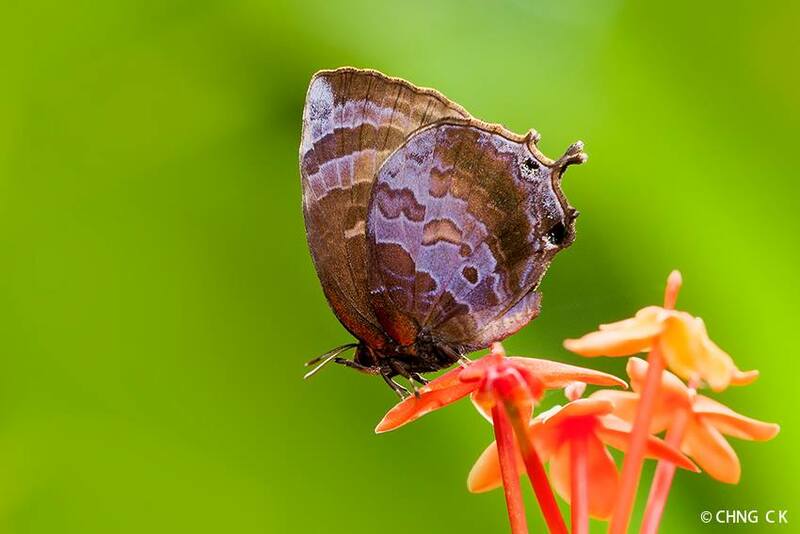 Moving apart bushes like the T-Rex did in Jurassic Park will not get you many nice butterfly photos. It is often advisable to stand back and observe the behaviour of your "prey" before moving in to shoot them. 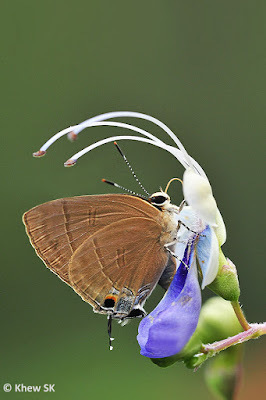 For butterflies that are fluttering actively from flower to flower, it is often more fruitful to "predict" which flower the butterfly would next go to, and wait there rather than chase the butterfly when it is already feeding on a flower. 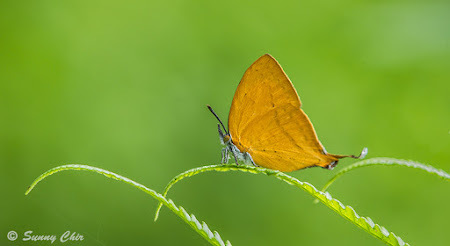 You will often have anything between 1 and 3 seconds to compose, focus and shoot, if you are lucky. 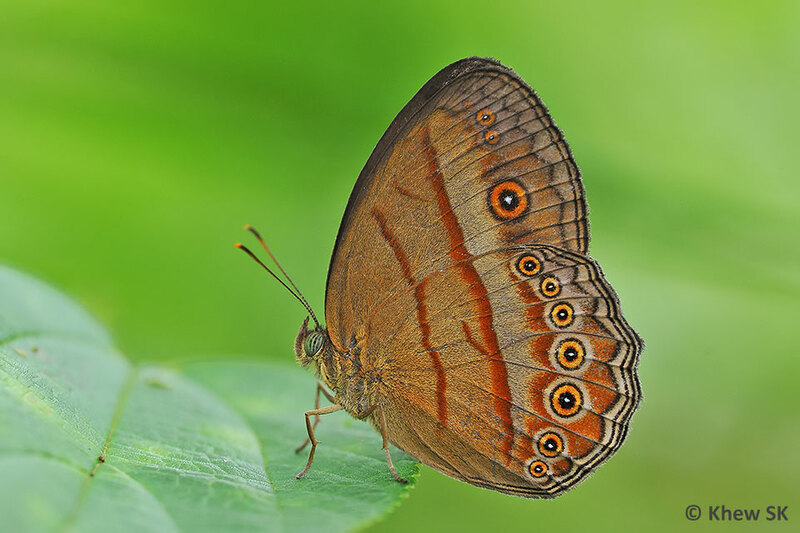 Different species of butterflies will have their corresponding "circles of fear" whereby they will take flight if an intrusion is detected. 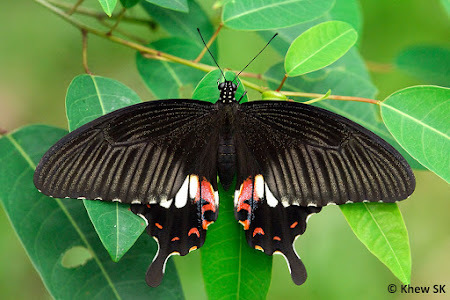 Remember that, to the butterfly, you are no different from a large predator coming in fast to attack them. 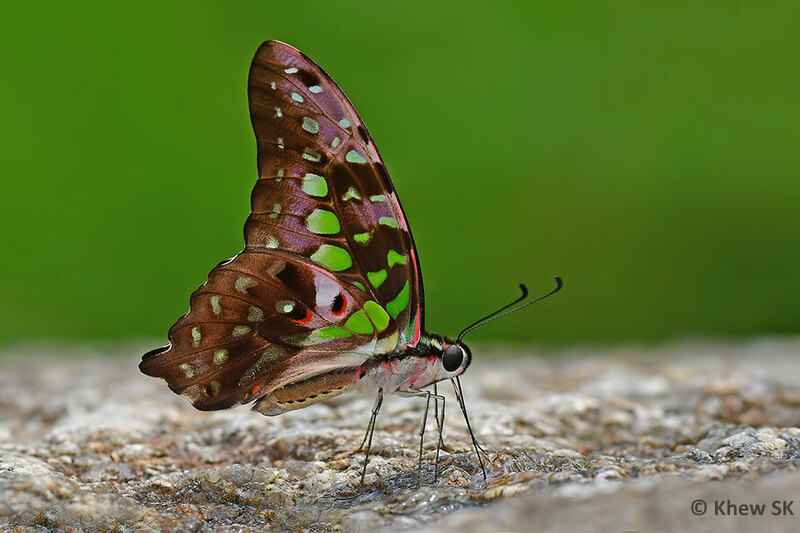 And the resultant reaction from the butterfly is to take flight. Hence move stealthily and avoid sudden movements. 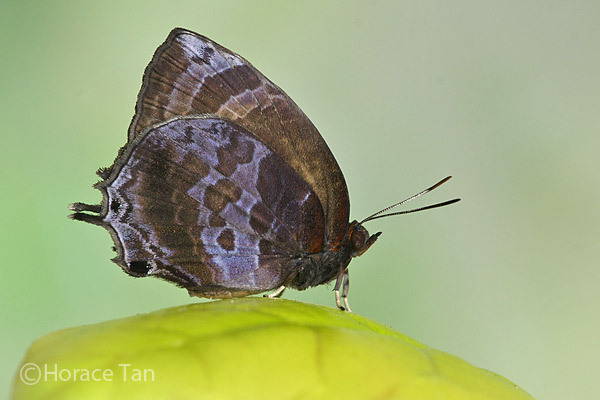 Some species are more skittish than others, and with some field experience, a butterfly photographer will quickly learn how to stalk and approach them. 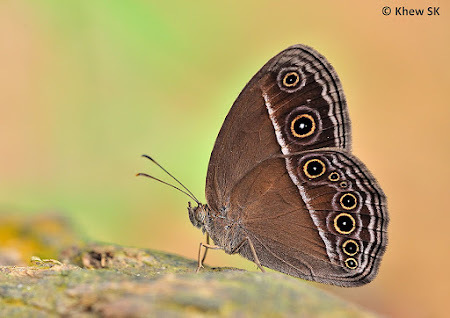 Proning is the best position for getting that butterfly's eye level shot! But be prepared for a good laundry effort at the end of the shooting day. To get that 'perfect' eye-level (the butterfly's eye level!) 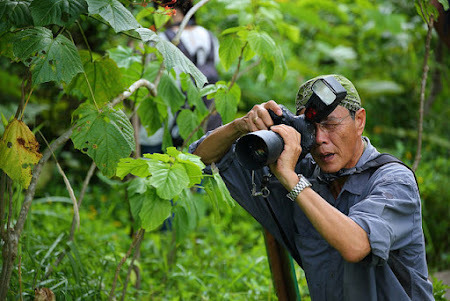 shot, many photographers have to contend with a spectrum of inconveniences and sometimes agony. These range from being soaked in a stream or having to prone in mud to get into the best position to shoot a butterfly. To the non-butterfly enthusiast, watching a butterfly photographer at work may be amusing, and often perceived as a most inadequate cause for suffering such agony just to get a photograph of a butterfly! Getting down low for that perfect shot! It is often useful to go butterfly shooting in a group of 2-4 so that you have extra pairs of eyes to spot butterflies. In the forests, it is also good to have shooting 'buddies', should anything untoward happen and you require some assistance in an emergency. 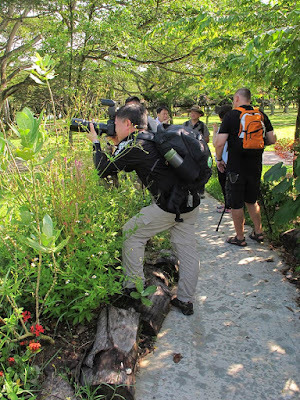 Larger groups are often less preferable, as too many photographers rushing to shoot a butterfly often ends up with no one getting a shot of it at all! This ends the Butterfly Photography 101 series of articles, and we hope that our readers have enjoyed the information shared in the series and found them useful. What remains is to go out in the field and keep shooting butterflies until you perfect your craft. The satisfaction of seeing a well-executed shot of a beautiful butterfly on your computer monitor is worth many hours of hard work in the field! 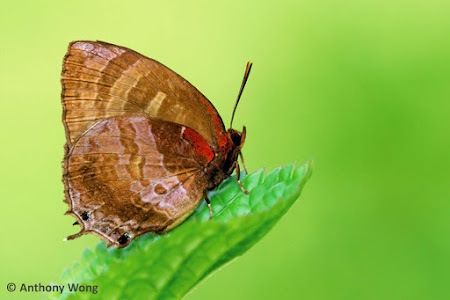 Text by Khew SK : Photos by Bob Cheong, Sunny Chir, Huang CJ, Khew SK, Loh Mei Yee, Loke PF and Simon Sng. The first two months of 2017 have been interesting from a global perspective, as the world watched the 45th President of the USA Donald Trump dish out interesting, but controversial executive orders. These ranged from building a 1,000 mile wall between the US and Mexico and immigration orders that barred visitors from seven Muslim-majority countries. 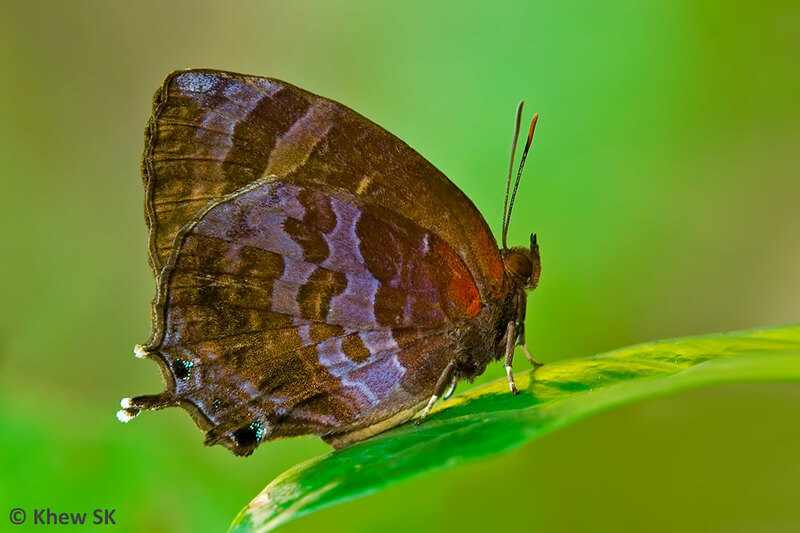 There appears to be a shift to nationalistic and protectionist policies in many countries in the world today. Whilst the rest of the world waits and wonders how all these changes in politics are going to affect each country's economy and trade, 2017 moves into a very uncertain and potentially tumultuous era as the Chinese population around the world heralded the year of the Fire Rooster. Predictions by soothsayers and geomancers from Nostradamus to local experts didn't have much positive news for the rest of the year. So it remains to be seen if their forecasts hold true. Speaking of roosters, the Year of the Rooster didn't start too auspiciously for a group of free-ranging chickens in Singapore. 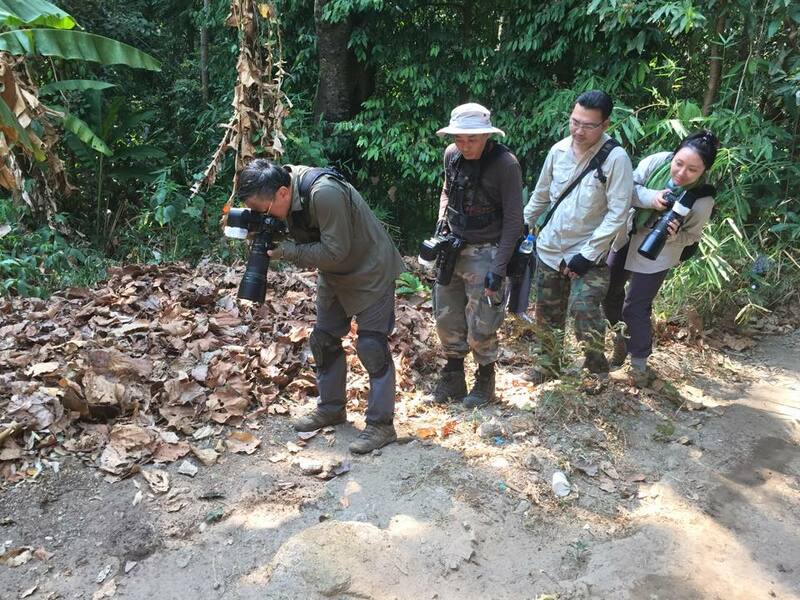 Apparently acting on complaints of noise nuisance, about 20 of these birds were rounded up by the authorities and summarily culled. 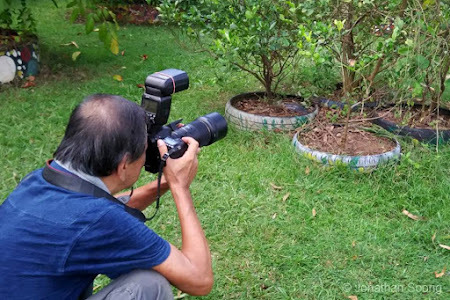 This raised the ire of local animal activists and the more tolerant public, which created a lot of buzz on social and mainstream media. 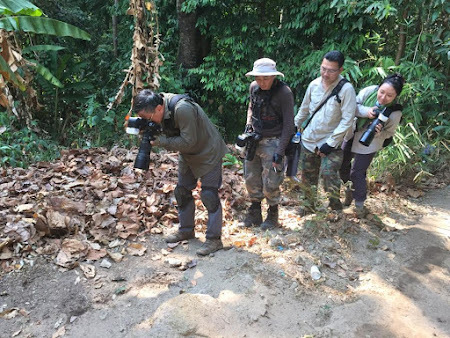 The rationale for the culling was later amended to public health safety reasons, but this appeared more of a bit of back-stepping by the authorities which didn't go down too well with the public. But the news of this fowl play provided quite a bit of chatter and amusement in cyberspace, and everyone, from the local coffeeshop auntie to our politicians gave their two cents worth on the matter. 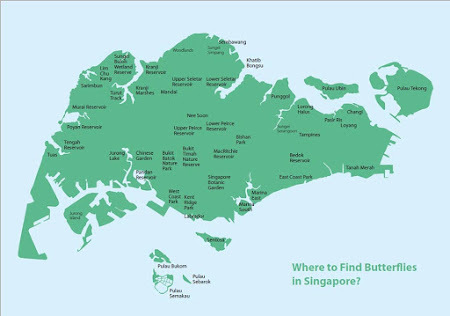 Then a life was lost when a massive 270-year old Tembusu tree fell at the Singapore Botanic Gardens. The tree, which was over 40m tall with a girth of 6.5m, had just been recently given a clean bill of health by government arborists, when it inexplicably uprooted, tilted over and crashed onto the hapless family who were waiting for a concert to start. Deepest condolences to the family of the deceased. Investigations are ongoing, but this is going to leave a lot more questions than anyone has answers for, as the tree fell on a normal fair day (albeit it was an exceptionally windy day on that day). I can only hope that the authorities do not adopt a knee-jerk reaction and start chopping down our large and beautiful trees around our City in a Garden. Our Butterfly of the Month for February 2017 is the Plain Plushblue (Flos apidanus saturatus). This is one of four species of Plushblues of the genus Flos that are extant in Singapore. It is the most regularly encountered of the four, and is moderately common. 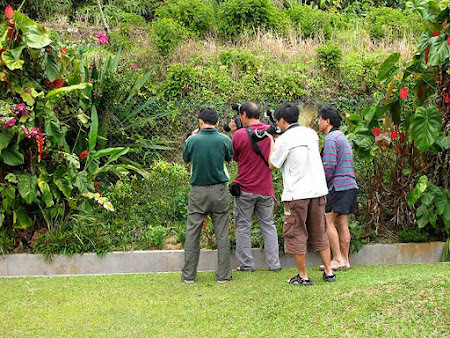 It can be encountered from our urban parks and gardens to the forested reaches of our nature reserves. 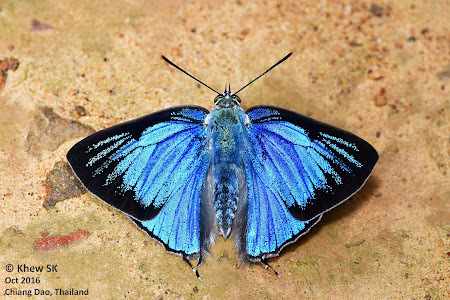 The male Plain Plushblue is deep blue-violet on the upperside, with a thin black forewing border. The female is a shining purple-blue with broad black borders on both wings. The upperside of this species is seldom seen nor photographed, except with the butterfly is encountered in the late evening hours of the day with the full sun shining at a low angle. 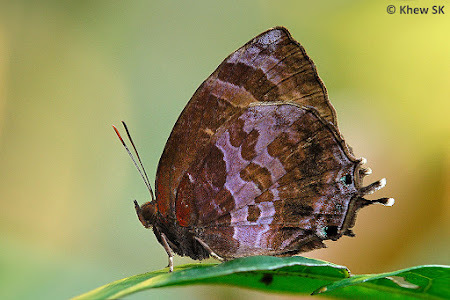 The underside of the species bears dark brown cryptic patterns with a purplish wash. There is a small reddish patch on the base of both wings that is more distinct in freshly-eclosed individuals. 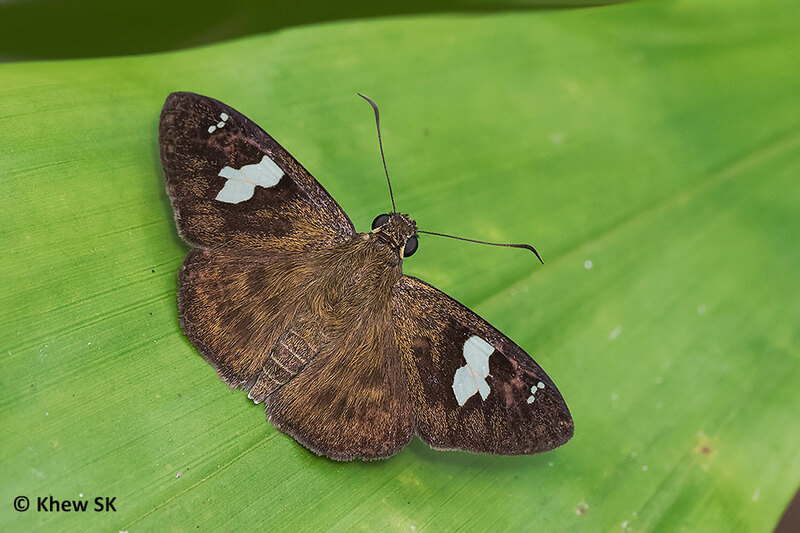 The hindwing bears a stubby white-tipped tail at vein 2 and is toothed at veins 1b and 3. 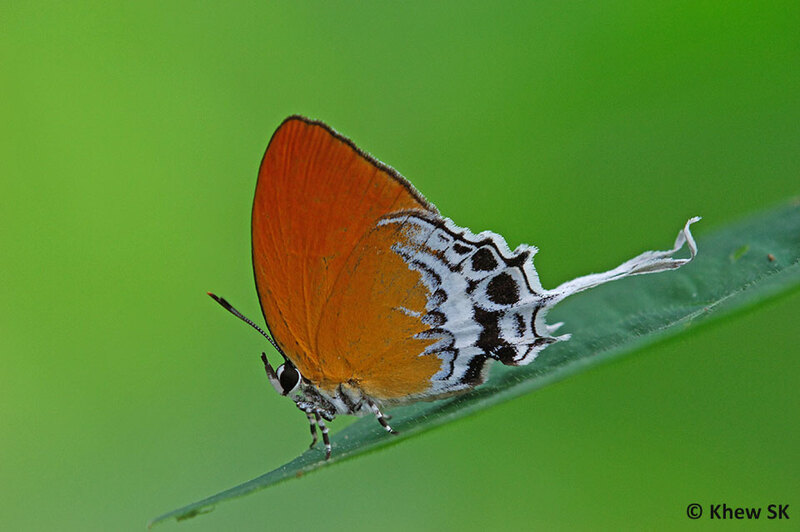 The butterfly is skittish and has a strong erratic flight when disturbed. The caterpillar of the Plain Plushblue feeds on a variety of host plants amongst which are two species of the Syzygium which are relatively common roadside bushes. 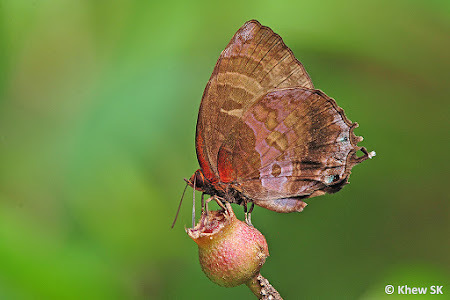 Usually, the species is encountered singly either feeding on the sap of certain plants, on the ripened fruits of the Singapore Rhododendron or on flowering plants. 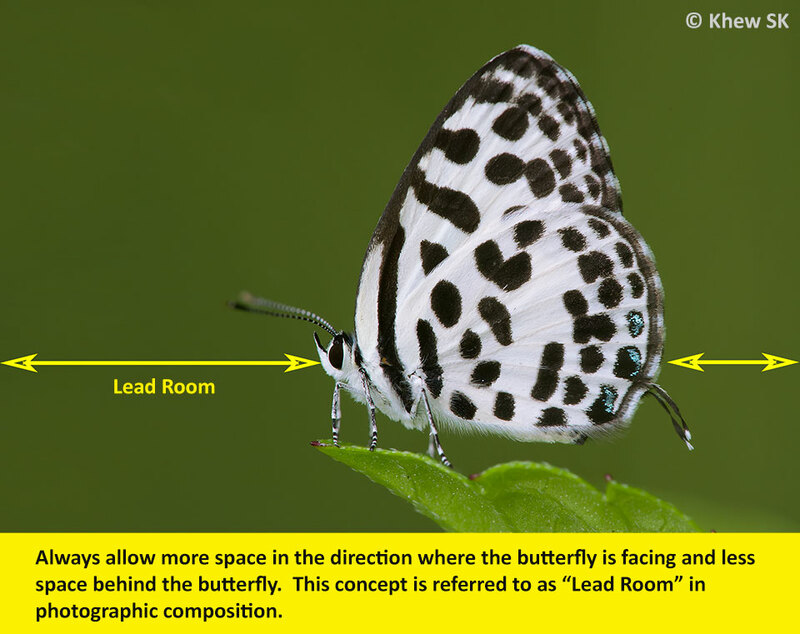 Last week, we introduced some of the more commonly used composition techniques in butterfly photography. 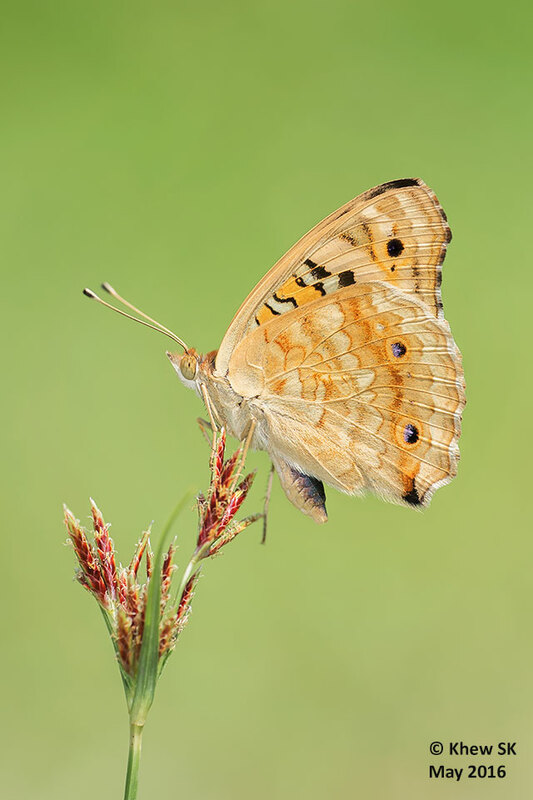 Continuing our discussion, we feature some of the more unconventional guidelines that you can consider when composing your butterfly photos. As mentioned previously, 'the only rule is that there are no rules' and all these tips are just composition tools that you have at your disposal to enhance the presentation of your butterfly photos. 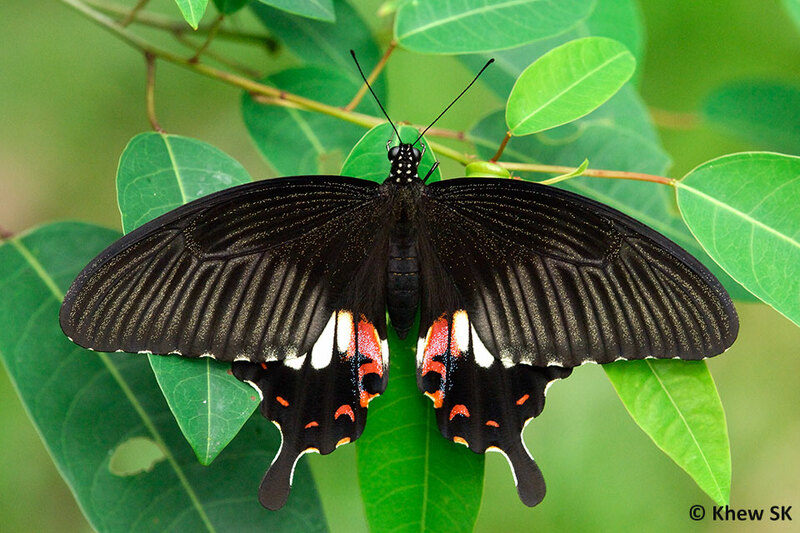 Butterflies are bilaterally symmetrical, where the wings on the left are mirrored along a central axis to the wings on the right. 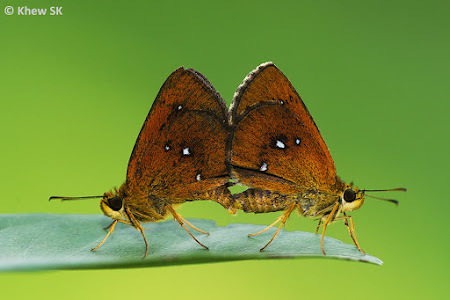 Symmetrical forms convey balance in and of themselves, but they could appear too stable and too balanced, leading to a lack of interest in the composition. 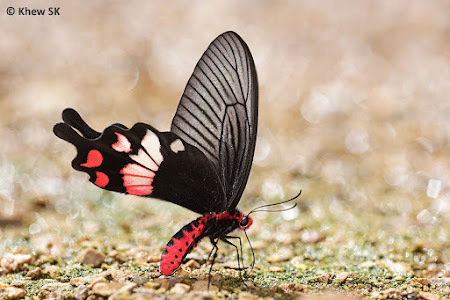 However, making use of the natural symmetry of the butterfly can sometimes allow the viewer to focus on the beauty of the butterfly without any distractions. Placing the butterfly in the middle of the frame and cropping it close, makes for a straightforward composition that can sometimes be refreshingly simple. For symmetrical butterfly shots, usually taken of the uppersides of a butterfly's wings, and depending on the shape of the butterfly's wings, a square crop could be considered in composing the shot. 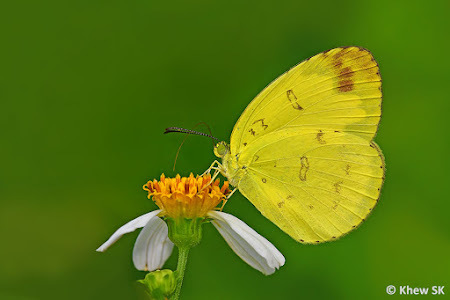 Like in the visual arts, there are often opportunities for the butterfly photographer to apply leading lines towards or away from the butterfly to create dynamic interest to the photo. 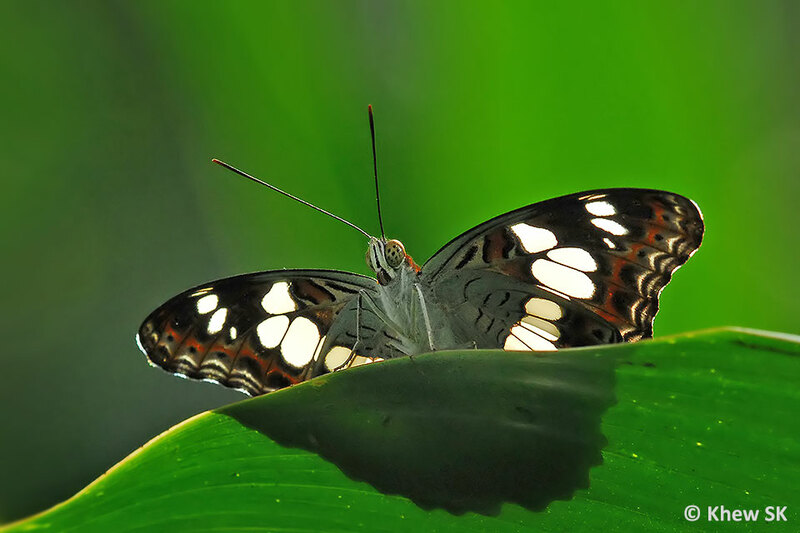 The use of the natural lines on a leaf or other "props" that a butterfly perches on, can draw the viewer's attention on the subject, whilst the leading lines accentuate the butterfly's position in the frame. 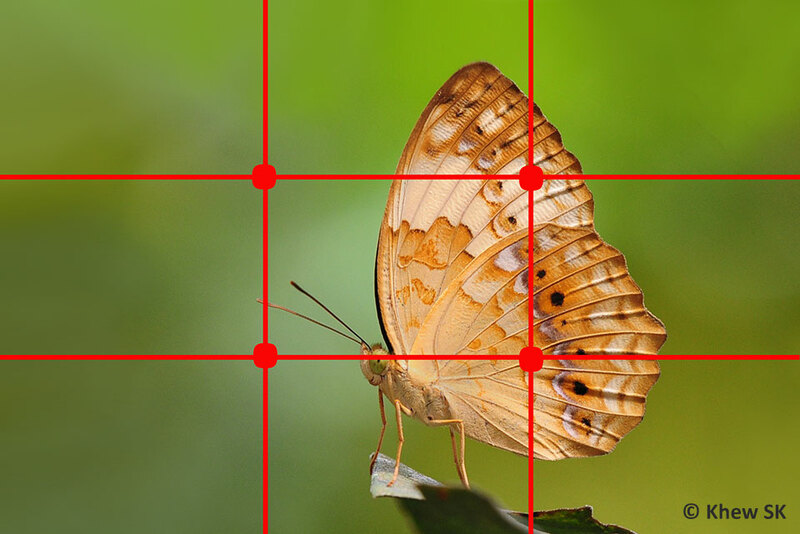 Lines need not necessarily be straight lines. Using sinuous curves that draw a viewer's eyes towards the subject butterfly often tends to create a more interesting and dynamic composition. 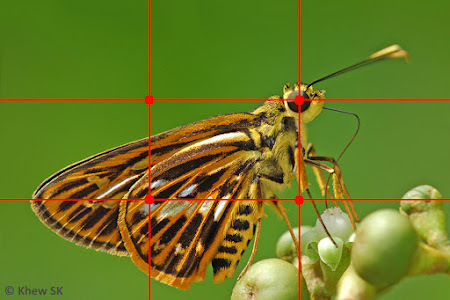 Using these geometric linearity of supplementary elements in the natural world helps to put a complimentary context to the subject in its environment in butterfly photography. 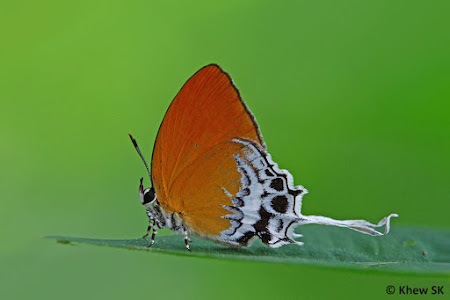 Ever so often, a butterfly photographer will encounter a butterfly perched on a drooping leaf and literally end up looking downwards. Some photographers feel that this is how the subject should faithfully be depicted - as it is seen and photographed in the field. However, this makes the butterfly appear as though it is about to slide off the leaf. Rotating the camera Anti-clockwise, this shot presents the butterfly perched on an X-Y axis and appears comfortable on its flat and horizontal perch. 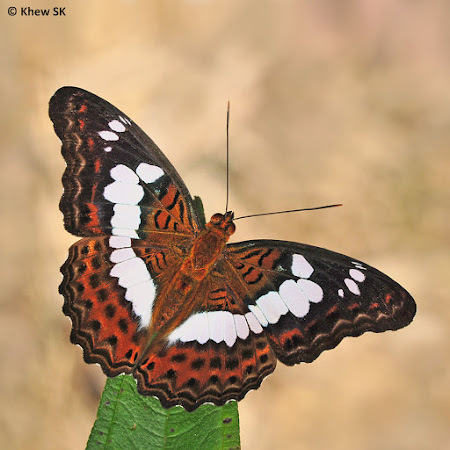 Sometimes, all it takes is a slight rotation of the camera body by a few degrees to make the butterfly appear 'proud' and looking upwards, giving it a much better composition with the subject standing upright. Although a matter of taste and preference, take a look at the comparison shots and decide what compositional position of the butterfly works for you. Coupled with the symmetry and shape of different species of butterflies, it is sometimes better to crop the frame other than the usual 4x6, 4x3 format. 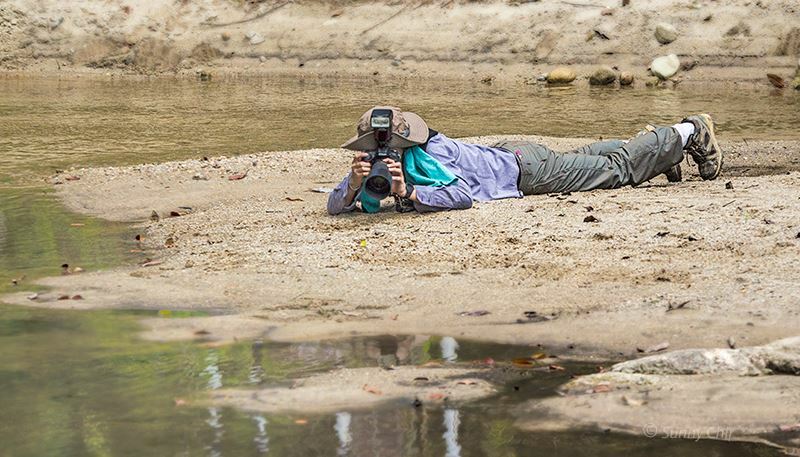 There will be opportunities to change the standard crop to better emphasise your subject (or subjects) in alternative formats other than the conventional crops used in photography. 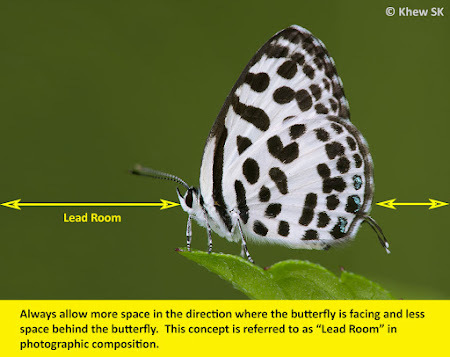 Consider using a portrait crop instead of a landscape crop, when composing a shot of the butterfly and various elements that the butterfly is perching on. 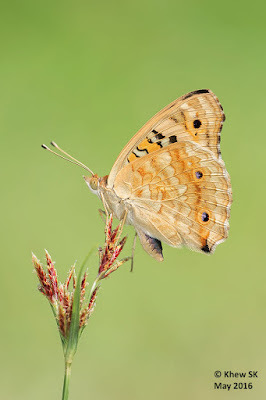 In situations where the butterfly perches on a vertical object, rotating the camera 90 degrees to the portrait position often yields a more well-balanced composition. 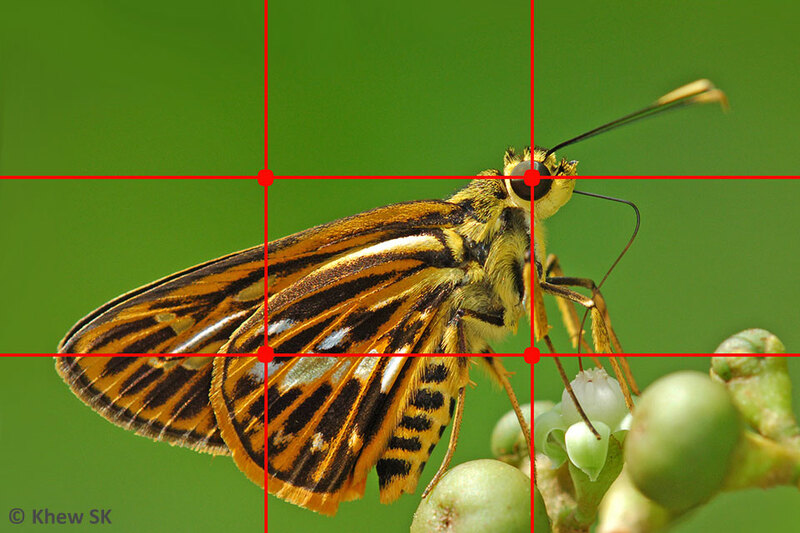 Using a completely geometric square crop may also work for different compositions of the butterfly. 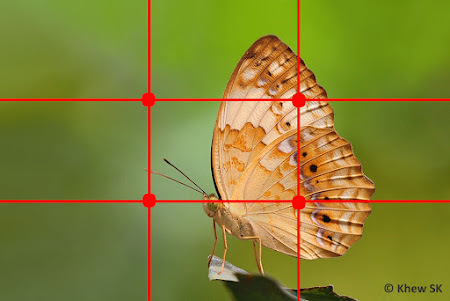 The square crop tends to work well with a symmetrical shot, placed either along the X-Y axis or along diagonals. 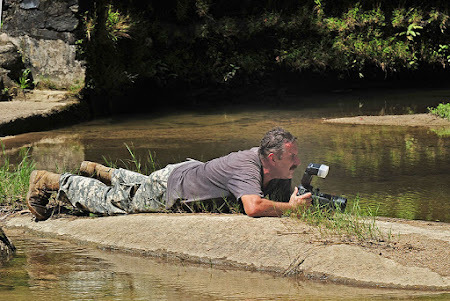 Out in the field, there are often many opportunities for you to be creative and experiment with unconventional angles at which to shoot your subjects. 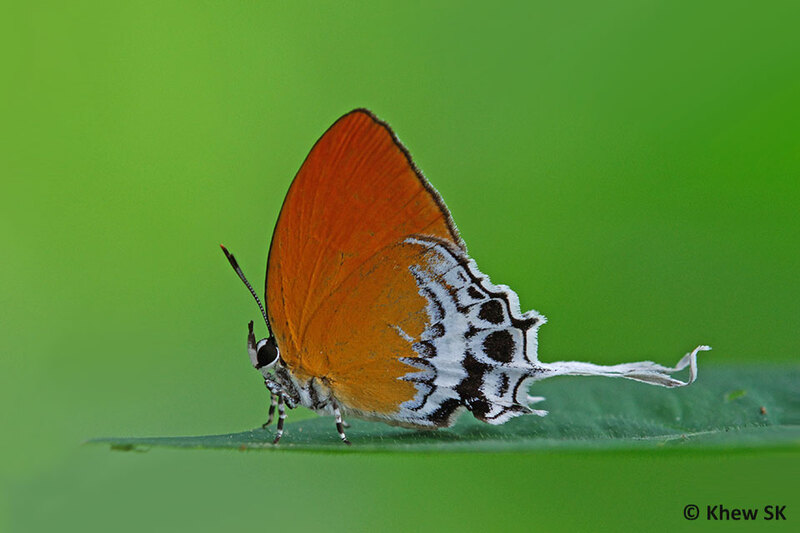 Change your perspective from the usual tried-and-tested compositions to create fresh ideas to showcase butterflies. There will be occasions when the butterfly poses in various uncommon positions for you to capture a new point of view. 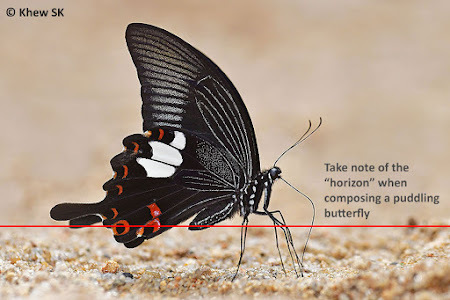 Do not be afraid to challenge the guidelines of visual composition that have been discussed in Parts 5 and this article. 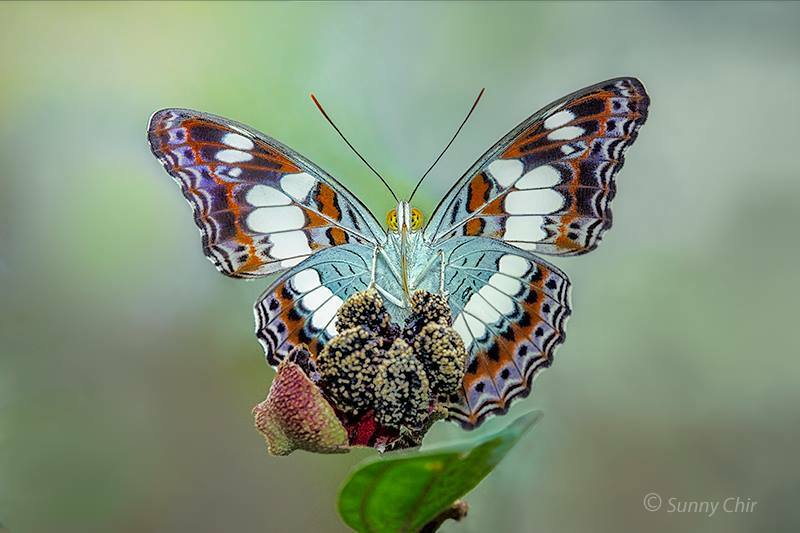 As could be expected in any creative field, sometimes breaking the rules in butterfly photography can result in novel and innovative ways of presenting a subject that can be pleasing to the eye and delighting your audience.